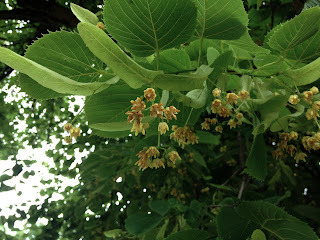 The linden trees are blooming. Also known as American basswood (Tilia americana) the trees produce prolific flowers and are a favorite of bees. Linden trees bare their flowers on cape-like pseudo-samaras. Because of their high nectar content, dried linden flowers are used to make tea in Europe.